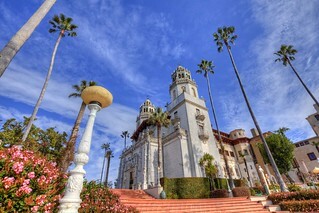 "Grande" is the best word to describe the main house at Hearst Castle. It's 60,645 square feet with 38 bedrooms and 41 bathrooms. This twin-towered residence, partly based on a church at Ronda in southern Spain, is constructed of reinforced concrete and faced with stone. It is located on the highest point of the site with an unimpeded view of the Santa Lucia mountains and the seacoast.